Bruno is an eight-year-old boy who has moved with his family from Berlin to Poland during the war. His dad is a powerful soldier who believes deeply in family. But Bruno is not too happy about moving away from his friends until he meets another boy, named Schmuel, who is separated from him by a tall electric fence. When Schmuel says his father has gone missing, Bruno, who loves nothing more than a great adventure, vows to get through the fence to help locate the father of The Boy in the Striped Pajamas. This proves to be a risky decision. The tension and suspense create several heart-racing scenes. It's fascinating to see the difficult, manipulating, and changing relationships of the family members. The innocence of the two boys as they learn about each other and the worlds they live in is heartbreaking and very touching. 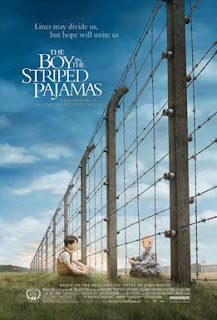 Although some critics have charged that the story is unrealistic and that no eight-year-old boys were ever around long enough to do work at Auschwitz (they were gassed immediately upon entry), this movie is a classic WWII drama.